Before SnapStream, associate professor Nicole Martins would have had to sort through about 800 TV episodes by hand to conduct her research. Martins is working with University of Wisconsin journalism professor Karyn Riddle to update a 20-year-old study about how violence is portrayed in primetime television. Instead of having to coordinate all of the recordings and pass out DVDs to the 20 student coders and workers assisting her, she can record everything digitally through the television search technology SnapStream, brought to The Media School for faculty use this year. “Having a DVR that not only records lots of things but allows me to upload those recordings to Box where I can share that with my coders and my student workers makes that a very attractive program and really easy to use,” Martins said. 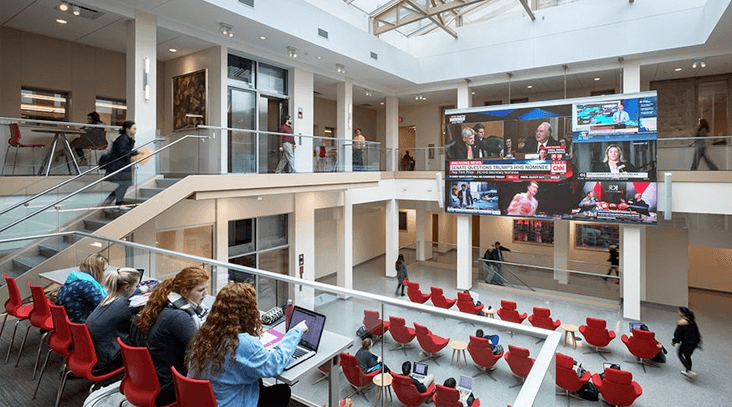 This year, The Media School implemented the television search technology SnapStream to make it easier for faculty members to sort through television programs for research purposes, allowing them to efficiently capture what’s going on in television media. The program was tested in the summer, and now it’s available for all Media School faculty to use. Sharon Mayell works as the assistant director and research associate in The Media School’s Institute for Communication Research and coordinates recordings through SnapStream. “It’s almost like a no-brainer because we’re a media school, and here we have this great service,” Mayell said. It’s essentially the world’s largest DVR, said Mayell, but more powerful. Through SnapStream, one can record six simultaneous channels for up to 10 days straight. The technology can be used to schedule recordings of anything from news programming to movies. Perhaps the most useful feature is its ability to capture a program’s closed captioning. Users can search for keywords in a program’s transcript and run a content analysis on exactly what they’re interested in. For example, somebody could use SnapStream to record multiple news channels’ coverage, search for “Black Lives Matter” in the transcription and compare the way each channel discusses the topic. The technology to record news programs and other content digitally is a benefit from a teaching and research standpoint, because it provides a better understanding of how topics are covered.